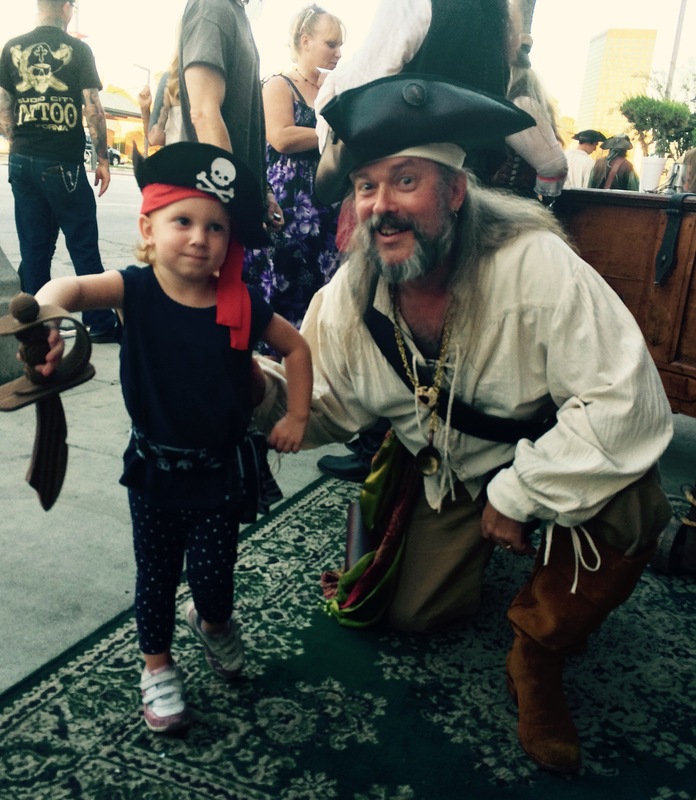 Ol’ Chumbucket greets a three-year-old pirate at Saturday’s Talk Like a Pirate Day party in Studio City, Calif.
Saturday was another grand Talk Like a Pirate Day. My friend, Mark Summers, and I started the holiday as a private joke twenty years ago. When we told syndicated newspaper columnist Dave Barry (who we now refer to as “our close personal friend, Pulitzer Prize winner Dave Barry”) and he wrote a column about it in 2002, the day just keeps going and going, getting bigger and more outrageous and – I’ll just say it – more absurd, year after year. We’ve traveled the country with it. We’ve performed in Las Vegas and Los Angeles and New Orleans and Philadelphia. We’ve done our schtick in museums and libraries and bars. We’ve done hundreds – that’s not an exaggeration, hundreds – of radio, TV and newspaper interviews all around the world. I suspect by now we’ve been on just about every radio station in Australia and New Zealand. This year I did an interview with a station in Germany. It’s not the way your parents might have hoped you’d come to the world’s attention, but when the wave comes up, you ride the wave. In the book business – maybe in others as well, but definitely in the book business – you hear a lot about platforms. You have to have a platform. There’s a lot of definitions as to the exact meaning of “platform,” but you’ve gotta have one. It’s the area you’re known for, how people identify you, sort of the reason anyone can be expected to buy your book. There are good discussions of the exact meaning here and here. But the point is, you have to have one. And my platform is pirates. A lot of people in the pirate re-enactor community – or as I prefer to call it, the pirate world – know me, recognize my name. At least, they recognize my pirate name – Ol’ Chumbucket. And most know that that’s me. 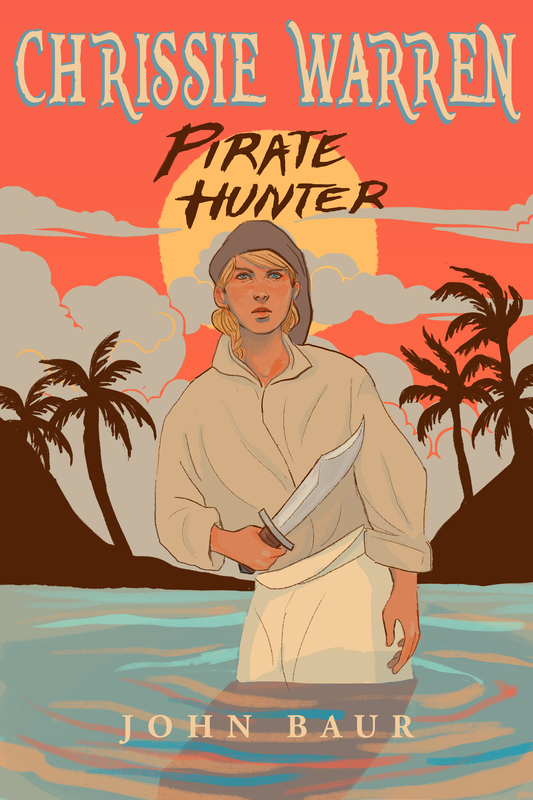 So my first three novels were all pirate adventures, including “Chrissie Warren: Pirate Hunter,” which I thought was the best of them and the most ready to self-pub. And that gives me another venue for going out to sell the book. Along with libraries (I’ve got my first library reading tonight!) and bookstores, I’m looking at pirate festivals all over the south and east. Hope to have more to say on that very soon. Getting very excited about this evening’s event at the East Jefferson Parish Regional Library. I’m one of three authors presenting their debut novels. (Between you and me, I’ve looked at the other two online and mine is head and shoulders above theirs.) I don’t know if many or even any people show up, but I’m looking forward to it. At least the other two authors will be there, so that’s something. I didn’t sell as many books as I’ve had liked in Los Angeles, but the venue really wasn’t right for it. Place was crawling with pirates but there wasn’t really a schedule or set up to read or sign. Still, it was a case of showing my face and getting out there so the public – or your public – can see you and get excited. You take these opportunities and you do the best you can with them, learning from them, and move on. We had this idea back in June to record “Pirate Feeling,” a parody or satire of the classic “You’ve Lost That Loving Feeling” by the Righteous Brothers, one of my favorite songs of all time. But what visuals would go over the audio? No one wants to look at me singing. They barely want to listen to me singing. We settled on the classic slide show montage. And asked friends from all over the pirate community to toss a couple of slides my way. We ended up with about 120. We needed about 40. Then we let it sit for a while. Good ideas, like good wine, need to age. Who said that? Anybody? Probably not, because we realized that was a terrible idea. Strike while the iron is hot would have been more to the point. Talk Like a Pirate Day is almost here (it’s Saturday, for those not in the know) and we had to get to work or give the idea up. We didn’t want to do that. So that was our weekend. We figured on, maybe two takes. Maybe three. We’d knock it out Saturday morning. Turned out it took almost all of two days, about 40 takes, at one point we had to run out and buy a microphone (the Blue Yetti, I highly recommend it. A great mike for not that much money.) We had to learn some interesting things about the audio software. Latency – what a stupid idea! And then when we finally had a take we could live with (we’d given up looking for perect around take 18) Tori took the audio and the e-pile of photos and her new computer and got to work weaving it all together. Only instead of weaving, it was more like pounding pegs into random holes when none of them quite fit. Thank God I’d bought her a new comptuer a week earlier. If we’d been counting on this serviceable, dependable, but four-year-old Macbook we’d still be working on it. When it was knew it was the greatest. Now the new Macbook Air blows its doors off like it was standing still, which a lot of times it is. The newer versions of the photo and video editing software cause it to crash with some regularity. But she got it done, and we’re happy with it. Got it posted on youtube, linked to Facebook and now linked here. Look, I know I’m no Bill Medley, or even Bill Murray. I’m a passable singer whose falsetto doesn’t go nearly high enough. But it was fun. And the rule of using social media is 9 to 1 – for every “buy my book” thing you post, try to post nine of you just being you. “Social media” is, after social.You’ll do nothing but annoy people if you try to turn it into your personal sales megaphone. Now I’ve got the trip to Los Angeles coming up (in support of the book,) a pirate party at Studio City Tattoo where I will try to sell as many copies of the book as I can. Then back to NOLA, where I have a reading slated next week at the library. And more stuff in the works. Because social media is good, but getting out there and meeting people face to face still can’t be beat. And if you sing ’em a little song? All the better.